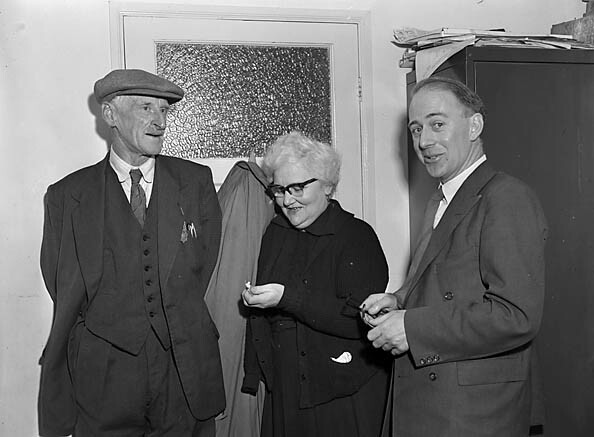 In search of the Welsh language in Ebbw Vale : Mr Clatworthy, Miss Mary Herbert and Mr Gwili Lewis. Teitl Cymraeg/Welsh title: Ar drywydd yr iaith yng Nglynebwy : Mr Clatworthy, Miss Mary Herbert a Mr Gwili Lewis. Nodyn/Note: Image taken on a visit by Geoff Charles and John Aelod Jones to Ebbw Vale to see how such an anglicised area would react to the National Eisteddfod, during which they met many local residents, including Mr Clatworthy, Miss Mary Herbert and Mr Gwili Lewis, who all work for the council.